Why this is a safe practice is discussed below in the sidebar. Heed that rule and all of those in the November column — we want you as a reader for a long time! Another surprise to hobbyists is that voltmeters themselves can be a source of danger. A maximum voltage rating is printed on your meter (see Figure 2). Heed it! That is the maximum voltage the probes, connectors, and body of the meter can withstand. A higher voltage may cause a flashover from the wiring to anything touching the case, such as your hand. FIGURE 2. Voltage ratings are shown next to a voltmeter’s probe jacks (1,000V DC and 750V AC). Exceeding these voltages can result in a flashover, also presenting a severe electrocution hazard. Electrocution caused by using meters beyond their voltage rating happens regularly. 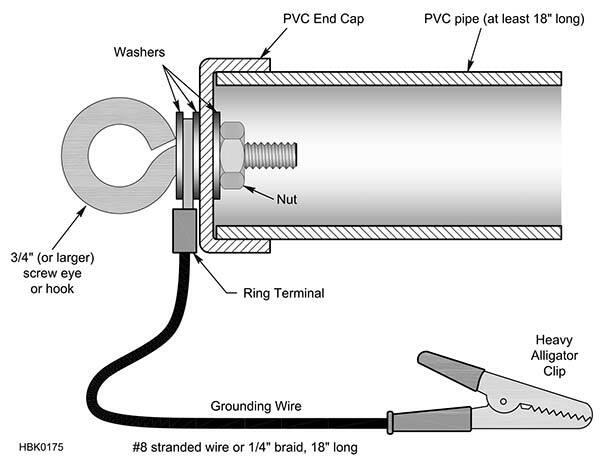 In the photo, note that the probes are recessed for extra insulation — use the right probes for the full rating. If you use a voltmeter to measure high voltages, power-down the equipment, discharge the high voltage points, then attach the meter to the point being measured. Place the meter where you can see it. Then, power-up the equipment and take a reading. That way, you’re not touching the meter when it’s energized. Special high voltage probes (such as the Fluke 80K-40 or B&K HV44-A) are available for the multi-kV voltages sometimes found in tube gear. Remember, it’s not a race. Take your time. Finally, follow the “switch to safety” rule long promoted by the ARRL (American Radio Relay League) in its literature. One of the ARRL’s early technical pioneers, Ross Hull, died in 1938 from an electric shock when working on transmitting equipment. The “Switch to Safety” campaign began thereafter. Don’t work on live equipment unless it’s absolutely necessary, and then take precautions. Follow basic safety procedures at all times. Don’t work alone and know how to respond if someone else does get a shock or burn. CPR courses are often available through a public safety agency like police or fire at very low cost or free. Electrical safety classes may be available through your power utility or an electrician’s trade union. Know how to remove power and show your friends and family how to remove power in your shop or station. This all sounds like a lot of bother I’m sure, but you won’t regret having those skills if they are ever needed. If you’re like most electronic-ers, you never throw anything away — especially test instruments and accessories. In the world of high voltage, this can be dangerous. As probes, fixtures, and connectors age, their insulation can become brittle and crack. That crack compromises the insulation, and you can even come in direct contact with the internal wiring. Before beginning a high voltage project, carefully inspect your test probes and other equipment. Make sure the insulation is clean, flexible, and not scuffed or cracked so it can protect you as you expect. ESD stands for electrostatic discharge. Anyone who has gotten a shock from walking across a carpet and touching a grounded object has experienced ESD. Figure 3A shows the IEC-61000-4-2 ESD waveform used for testing devices that will be subjected to static electricity. Pulse voltages are typically around 2 kV but can be as high as 15 kV! The various models and tests are discussed in the STMicroelectronics document DM00023467.pdf which is available online. FIGURE 3A. 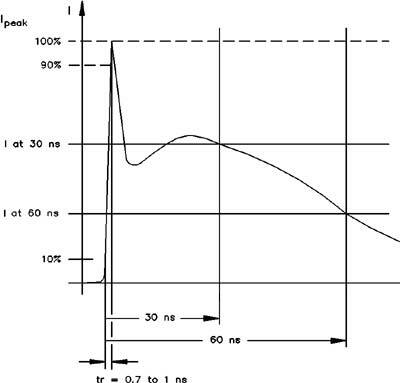 The IEC 60001-4-2 electrostatic discharge (ESD) waveform (A- top). 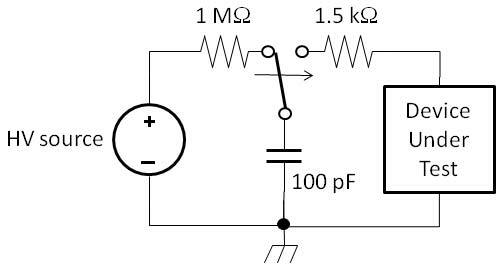 The Human Body Model (HBM) circuit (B- bottom) is used to perform ESD testing on equipment. You can often take these old capacitors to a local utility or recycling center for proper disposal. Some locations have hazardous waste disposal events where they will take these old components. It should be obvious that you don’t want to use them if the oil is leaking from the seals or if the enclosing can is dented or punctured. Once discharged, it’s good practice to install a shorting wire across the capacitor to avoid self-charging to hazardous voltages. 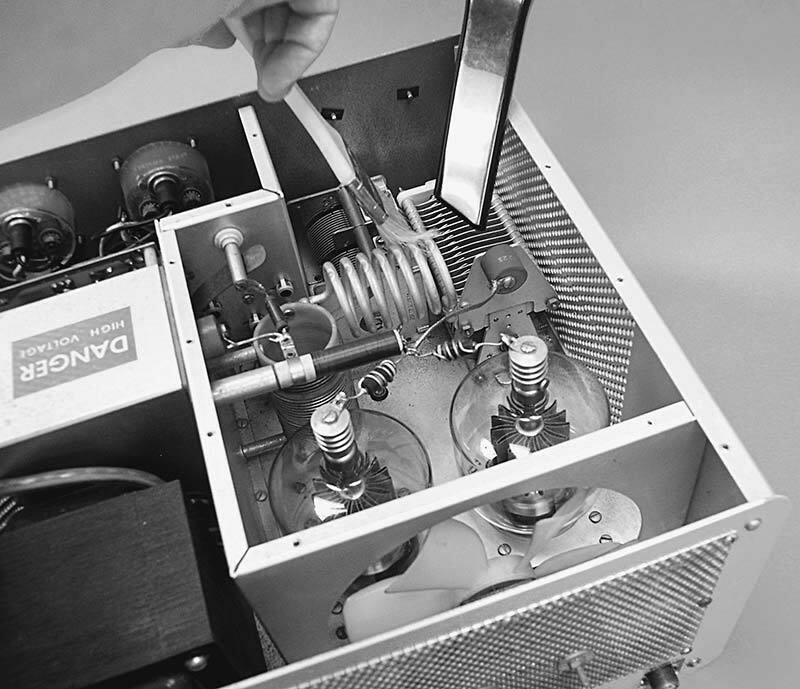 Vacuum- and air-variable capacitors are often used for tuning or adjusting high power RF circuits. Vacuum capacitors have voltage ratings of 10 kV or more and values up to 2,000-3,000 pF. The electrodes are copper cylinders, and the variable models move one cylinder with a threaded shaft attached to flexible copper bellows. Air-variables have somewhat lower voltage ratings. Semi-circular plates connected in parallel are interleaved to create the necessary area. One set of plates is attached to a rotating shaft to vary the amount by which the plates overlap to change the capacitor’s value. These capacitor types are non-polarized, meaning they can be used with AC or either DC voltage polarity. However, you should pay attention to which electrode is closest to the outside of the capacitor’s insulation. This is often marked with a line on the component’s body. The reason this matters is that many capacitors are connected with one electrode tied to circuit common or chassis ground. If the capacitor fails shorted, connecting the outer electrode to the lower voltage point reduces the safety hazard. If you’re going to connect capacitors directly to the AC line, you should use X- and Y-type self-healing metalized film capacitors. X capacitors are connected from line to line, and Y capacitors are connected from line to ground. (See www.tecategroup.com/capacitors/applications/ac-safety-capacitors.php for an overview of these capacitors.) These capacitors are safety-tested to minimize fire or shock hazards. Dust, dirt, and grime are the mortal enemy of high voltage electronics. Not only do they make it harder for a component to dissipate heat, they can be conductive too. High voltages also attract other particles such as oil mist or water vapor. The result can be a surprisingly large buildup inside your equipment. Once foreign substances get inside, they are electrostatically attracted to surfaces, wires, and components by the high voltages. Eventually, enough accumulates to create a physical connection between two points at different voltages — such as from one end of a resistor to the other, across an insulator, or from a high voltage point to ground. This creates a leakage path and small leakage currents start to flow. Figure 4 shows a good method of using a paint brush and vacuum cleaner to do the job. Knock the dust loose with the brush and vacuum it up. Don’t blow the dust away as it just gets deeper into crevices and flies away to other places it shouldn’t be. For stubborn or caked-on material or grease/oil deposits, use a soft cloth and mild solvent to remove it. (If you use soap and water, be sure to clean away any soap residue with a water-only wipe.) After cleaning with liquids, let the equipment dry thoroughly before turning it back on. In closing, remember the number one rule for working with or around high voltage: Be smart! You might not get a second chance. 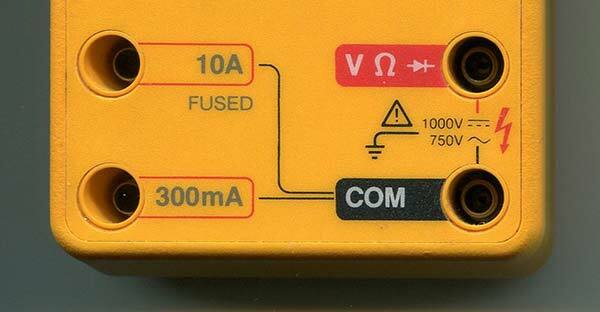 This is particularly important if you are used to working on low voltage circuits and equipment. 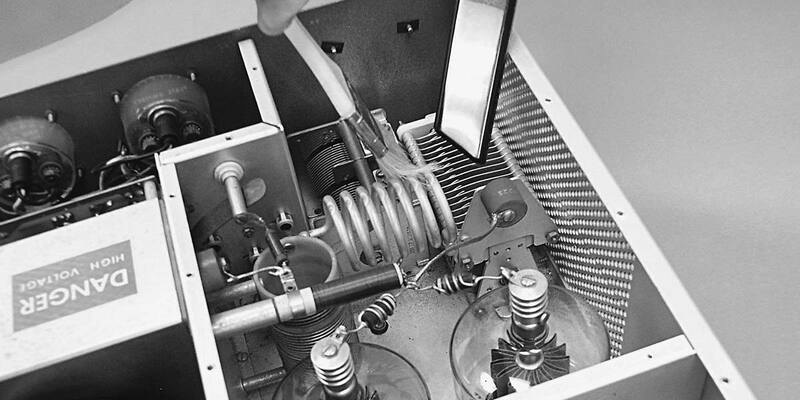 If you like building tube gear, you’ll probably have to build your own power supply. Not too many manufacturers are selling adjustable regulated HV supplies these days! Bryant Julstrom KCØZNG (an ARRL Handbook contributor and prolific builder) designed just such a power source in his August 2014 QST article that is downloadble at www.arrl.org/files/file/QST/This%20Month%20in%20QST/August%202014/JULSTROM.pdf. The supply output of 150-260 VDC is regulated up to 50 mA. A 6.3 VAC output for filaments is also available. Just the thing for getting your “hollow-state” designs up and running!